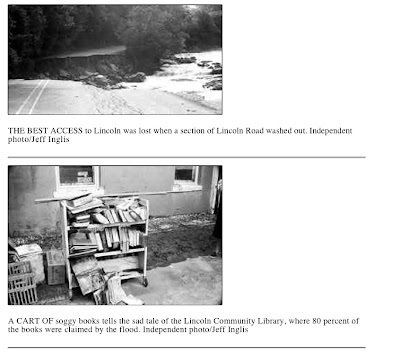 LINCOLN - The clean-up effort began even before the water receded. Volunteers who had been up all Friday night ensuring residents' safety were back at work on Saturday and Sunday dealing with the aftermath. In addition to the town residents, the Starksboro Fire Department was on the scene quickly, setting up road blocks and helping direct traffic around washouts. Also responding quickly was the Army National Guard from Vergennes. 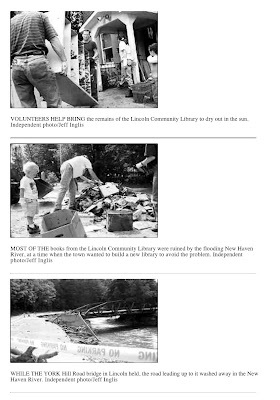 The biggest turnout for a single effort was at Burnham Hall, where the Lincoln Community Library lost 80 percent of its collection, despite a desperate midnight rescue effort mounted by town residents. "When I got there it was already up to the windows," said Lincoln Constable Art Pixley. He had been out helping residents evacuate from their threatened houses. The library was a lost cause. As daylight broke Saturday, residents - already awake - came out to assess the damage. "The first book I saw was Sidney Sheldon's 'Nothing Lasts Forever,'" said Reed Prescott of Lincoln. Floating on the lawn was a copy of "New England's Weather Disasters," he said. Liam and Ike Mulqueen-Duquette were among the children helping clean out the library. They put the books in a trailer which would be hauled to the dump, but not before the kids had had last looks at the pages of their ruined treasures. Kids went through the children's book section, saying "I remember this story!" Ike Mulqueen-Duquette sorted the books, throwing the "Haven't read it" group into a different area of the trailer than the "Read it" group. Bill Purdah was a volunteer helping with the book disposal. He said he initially felt bad throwing them all away but realized that they weren't really books anymore. "It's a sodden mass of mud and paper," he said. Charlie Piasecki of Bristol Insurance came up to look at the damage to the library and to help the clean-up. "They're very fortunate that they had the foresight to take out flood insurance," he said. The insurance adjuster was scheduled to come Monday morning to survey the damage. Burnham Committee member Nancy Stevens was saddened by the fact that the flood coverage for the contents of the building was not very high, but she was optimistic about the future of the library. "The town of Lincoln will come forward," she said. 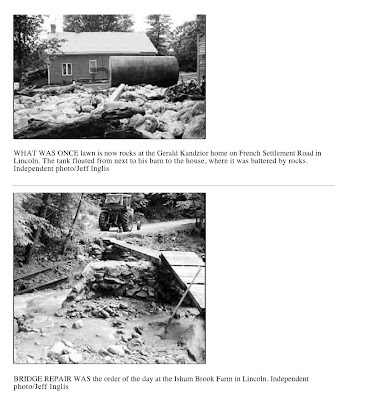 Up at French Settlement, the road was mostly washed away. Anne Parfitt and Don Brumfield made it down to the Lincoln General Store on foot. "The river came, swirled around and took a new course," Parfitt said. "We're totally wiped out up there." Several residents, including drivers from Atkins Trucking, as well as Bill Jesdale and Bill Masterson, helped the repair work by dumping and spreading dirt over where French Settlement Road had been. Gerold Kandzior, who lives at the bottom of French Settlement Road, had some friends helping to clean out the 6 inches of mud on the floor of his barn. He suspected at least one septic tank upstream from him had ruptured because of the stench from the mud. The yard he used to mow was totally covered with stones from the river and roadbed. The river, which had flowed past his barn, has a new course now, about 10 feet further out. Saturday morning, though, the whole place was filled with water. Only an old rusty holding tank, which floated over to the house from beside the barn, saved the house from being demolished by the rocks and branches. Kandzior was evacuated by the fire department early in the morning on Saturday because there were propane tanks further up the road which officials feared might float down and explode. The tanks didn't end up on Kandzior's property, though a neighbor's motorcycle was upended and covered in mud and grass next to the barn. "Messy, messy, messy," Kandzior said. Central Vermont Public Service crews were on the scene Sunday, driving in from Rutland and Middlebury. The damage to the power lines was surprisingly light, they said. They had brought several bucket trucks as well as other equipment to repair the damage. "We had no idea what to expect, so we came loaded for bear," one crewman said. Ed Trombley, a crew chief, said that the power was ready to go on in the Lincoln area. All that remained was for the connection to be made by the Twin Bridges and then some small areas would be brought on later. He said that power could be on the Lincoln area by as soon as Monday. Two poles by the Squirrel's Nest Restaurant were the village's link with the outside power grid. When those gave way, Lincoln was darkened.